Former British PM says the Palestinian issue is the key to reaching Middle East peace. 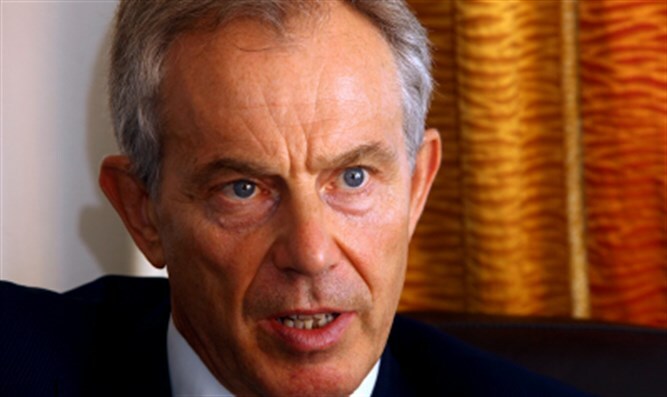 Former British Prime Minister and Quartet Middle East Envoy Tony Blair on Wednesday said that the circumstances are ripe for a Middle East peace process, calling all sides to seize the opportunity. “There exists today a new path to peace. It is based not only on conventional Israeli-Palestinian negotiations, but on the potential for a new relationship between the Arab nations and Israel. It is an opportunity of unprecedented promise. We must grasp it with both hands,” Blair told the 2017 Herzliya Conference. “The credibility of the ‘peace process’ has been profoundly damaged since the Oslo accords. Whatever the explanation, the outcome for the moment is that many Palestinians have concluded that Israel is not serious about negotiating a Palestinian state, and many Israelis have concluded that Palestinian politics is incapable of running one consistent with Israel’s security,” he continued. “This has led to such a widespread depression about the prospects for peace, that it is possible to miss a movement of momentous historical significance which offers the opportunity to change the whole dynamic in a radical and positive way,” said Blair. Blair served as the envoy of the Middle East Quartet until he resigned in 2015, but has continued to act independently to restart the peace process between Israel and the Palestinian Authority (PA). Reports last year said Blair was on a list of several international figures behind a failed move designed to legitimize the addition of the Zionist Union to the Israeli coalition, in an attempt to then restart peace talks. Earlier this year, British media reported that Blair had contacts with U.S. President Donald Trump about the possibility of becoming his Middle East adviser. Blair denied the reports.